In the game of Guatemala Cafe you get to pretend to be a coffee farmer. Your goal is to grow the most crops and earn more money then your opponents. Just one problem... Money isn't enough money these days. Guatemala Cafe will have you and your opponents trying to outsmart one another as you work to grow your farm. Guatemala Cafe is full of competition and will have you doing your best to be the best Coffee bean farmer. 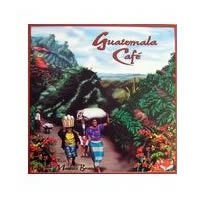 Play Guatemala Cafe for a fun, action-packed game. See the Guatemala Cafe game rules and instructions. Please keep in mind that the official Guatemala Cafe board game rules and instructions could be different depending on the game version you have. The rules below are some of the exact directions on how to play Guatemala Cafe. Share with us your comments, funny stories, tips, advice, strategies, creative ways to play, questions about how to play, problems with the rules or anything you want about Guatemala Cafe. All submissions will be reviewed within 24 hours. Click here to add your Guatemala Cafe comments.